Cost: US$872 (3% discount when direct purchase outside eBay) + shipping . We are spoilt for choice when it comes to DAC's (and all hi-fi) these days. There seem to be so many available now that choosing one is becoming quite a difficult task. Many of them come from the Far East, often only available directly, or through an Ebay shop. 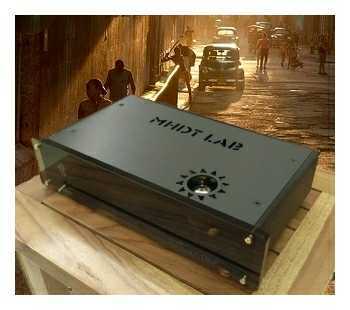 One such supplier is Mhdt Laboratory Audio Devices who are based in China, and they supplied the subject of this review, their top-of-the-range Havana DAC. I had heard of Mhdt Lab prior to this review as it is quite common to read their customers' comments on various forums. Judging by those comments it would seem that the other Mhdt DAC's, the Paradisea, and the Constantine+ have been very well received by those who have bought them. When offered a choice of their DAC's for this review, I decided to go for the Havana primarily because it doesn't use the 1543 or 1545 DAC chips. I have nothing against either of those chips but have already heard several DAC's that utilize them. What stood out for me about the Havana was that it used a less well-known DAC chip, the Burr Brown PCM56P, or rather two of them in dual mono mode. The PCM56P isn't a new chip, in fact it is one of the older DAC chips so why would anybody want to build a DAC around them. Well I can think of two possible reasons: either they are dirt cheap, or the designers really like them. I would suggest that in the case of the Havana, the second reason is the more likely one if you are designing your top-of-the-range DAC! And there's nothing wrong with using an 'older' chip as fans of the TDA 1541 will tell you. I love the TDA1543, and that's no longer in production. The PCM56P's are teamed up with the CS8414 receiver chip in non-over-sampling mode. This limits the operation to 96Khz and precludes the use of an HDCD facility but then most NOS DAC's have a very similar specification in that respect. The tube output stage comes with a GE5670 and you can also use 2C51, 396A, 6385, 6CC42, 6854, 6N3, 6854, CV2575, CV4013, CV5894, CV8247, CV2381 alternatives, if you are into tube-rolling. There are inputs for SPDIF coaxial, Toslink, and USB. But I was a little disappointed that there is no BNC connector on a DAC at this price. Power is user selectable between 115 and 230 volts. The Havana is housed in an attractive case, a mixture of brushed aluminium, with smoked acrylic sheet for the front panel. I find that a little odd as the justification for a metallic case is to screen against RFI. With an acrylic front, the screening is effectively compromised although in practice, this didn't seem to have any negative affect on the sound. The smoked acrylic front looks classy and allows the various LED's to be visible without them protruding through holes in the front panel. The on/off switch is situated on the front panel slightly to the left of centre. The tube is visible through an aperture cut into the top panel of the case (and to a lesser degree through the acrylic front panel). On the rear of the case we find the RCA analogue output sockets, the Toslink optical socket, the RCA digital input socket, and the USB socket. And of course an IEC mains inlet socket. In addition, there's a switch for selecting between the Toslink and coaxial inputs. Overall, the Havana has an attractive appearance, and is fairly compact taking into consideration that it also houses a tube buffer. It's dimensions are: 28cm(L) x 15cm (W), 7.5cm (H), and it weighs in at 1.83 Kg. The review sample came very well packaged and with no signs of any damage in transit. Having unpacked it, I set it up in my second system for a few days to burn in and then went back for an audition. The system comprised a modified Logitech SB3 feeding the Havana which I was able to feed straight into a Virtue Audio TWO class-T amplifier as the former already has a buffer stage. Speakers were my slightly modified Mordaunt-Short Pageant II's. The first thing that I did was to turn up the volume (to maximum) with no music playing and listen for any unwanted noise. There wasn't any even through these highly efficient speakers, and for a DAC with a tube stage, the Havana is very quiet. Sound wise the Havana is impressive! A big bold presentation that digs out detail in spades! It's one of those items of hi-fi that encourages you to throw the most difficult material at it and then impresses you with how well it controls it. Playing some Patricia Barber I was very impressed by the tightness of the acoustic bass, and the almost life-sized portrayal of the drums. Everything started and stopped with an immediacy that made the presentation quite exciting. Imaging is very strong, and the sound stage wide and deep. Tonal balance is even throughout the frequency range. The Havana is musical in its presentation. I initially found that male vocals were a little chesty in some instances. Not all of them but in some recordings, it did make the vocalist sound slightly different to how I heard them on something like my Scott Nixon DacKit. And talking of the DacKit (and mine is highly modified), I thought that it bettered the Havana in terms of emotion conveyed in the music. That's not to say that the Havana didn't convey emotion, just that the DacKit did so better to my ears. I now believe that the 'chestiness' was down to the Havana not being fully burned in, and did not notice it at all later in my auditioning. Other than that I couldn't fault the Havana but to be very honest, I didn't find it engaging enough to listen to for very long, so I moved the Havana to my main system to see how it worked there. Having put the Havana into my main system of Logitech SB3, Behringer DEQ2496, Havana, four-channel Gainclone and Hawthorne Duets (with active crossover and separate solid state amp for the woofers) I found nothing much more to say about it. I found it very impressive in all the 'hi-fi' ways but without that something that really kept me glued to my seat. I was wondering how something that sounded so good could not appeal to me more, and spent time trying to analyse exactly what was actually wrong. I couldn't really come to any conclusion other than it wasn't making me happy to listen to it, even though I was impressed. Then I had an idea. I've been very aware of the importance of the support system for any piece of hi-fi since doing the VertexAQ review. So I took one of their coupling systems and put it between the Havana's base and the granite equipment platform. And within a few minutes I was totally in love with the Havana! I find that the Vertex couplers work well with almost anything I put them under but hadn't experienced a transformation on this scale! Everything improved but most importantly the Havana now brought out the emotion in the music in spades! The deep, tight bass also became faster and more tuneful. With the coupler system in place, the Havana really sings! The next step was to connect the Havana up to a PC via the USB connection (instead of the SB3). I used my usual combination of an Pentium3 PC running Ubuntu, with Exhaile as the music playback software. It wasn't possible to do a true AB comparison with the SB3 set-up because with that I use the Behringer DEQ2496 to equalize the bass, but what I can report is that using the USB connection, the Havana is every bit as good as it is with the SB3. In fact, the USB connection is slightly more transparent than the SB3 connection but without the advantage of using the DEQ2496, bass is not quite so tight, and the sound stage is not quite so clearly defined. These comments apply to all USB DAC's that can be connected via both USB and SPDIF, and they are not a criticism of the Havana's performance. In fact, the Havana's performance was possibly the best that I have heard via USB, and I regretted that the KingRex UD-01 had been returned and was not available for a direct comparison. With either source, I really liked the Havana. I particularly loved anything with strings in it. Violins were portrayed with a rich smooth tone that reminded me of drinking a good glass of Guinness. Acoustic guitar strings had a clarity that surpassed anything that I had heard with other DAC's, and what beautiful tone! And bass was as tight as I've heard on anything else too! The Havana manages to maintain a strong (powerful) presentation together with a gentleness that allows the finest details to be heard and not over-powered. The sheer amount of micro-detail ensures that any ambience is very evident. For instance, on the album 'Toward The Within' by 'Dead Can Dance', track 6, 'The Wind that Shakes the Barley' revealed background sounds that I hadn't noticed before. Breath sounds from vocalists were also very noticeable, as were finger slides on guitar, and key-presses on saxophones. I couldn't find anything that the Havana didn't do a great job of playing. And for some reason that I'm not sure of, it did a particularly fine job of playing older recordings, ones that are normally a little bit under-whelming. The Havana seemed to give these recording s a bit of a 'boost' making them sound 'fresher'. It's an old cliché in hi-fi, but the Havana really did take me closer to the music! Apart from the lack of a BNC socket, the only thing that I can criticise the Havana for is in the need for a better method of coupling it to the equipment platform, ie 'draining' out the microphonics. It also makes a small noise as the muting delay relay clicks in but that is better than the sound of the tube buffer warming up! On that subject it is also worth noting that the Havana does sound better after warming up for about an hour, so it is a good idea to power it up well before you want to start listening. Having said that, it doesn't sound anywhere near 'bad' for that first hour! But also remember my comments about the mounting. It doesn't really sing until that is sorted out. I'm still a bit surprised at how much improvement the couplers made but perhaps the answer lies as much with the tube stage as the DAC section; tubes are much more microphonic! So I strongly recommend the VertexAQ couplers and a good granite platform but you may have your own preferred methods for optimally mounting equipment. So is the Havana worth it's asking price? I say "yes" unequivocally, if only for it's level of performance. The fact that it comes with a tube stage too is further justification. In fact we shouldn't underestimate the quality of the tube stage in assessing the performance of the Havana! 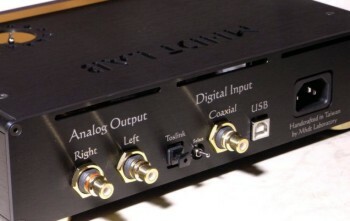 The cost of a separate decent buffer or pre amp (to match the sound quality of the Havana), and an extra set of interconnects, should be offset against the price of the Havana. Then it appears even more competitive in terms of cost! So you can add this reviewer to the Mhdt Lab fan club! 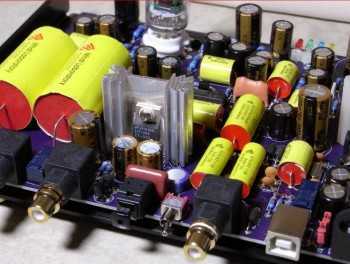 When it comes to making a decent sounding DAC, they certainly appear to know what they are doing. The Havana gets a very hearty recommendation. I started this review talking about how a lot of (if not most) hi-fi is sold these days, ie directly from the Far East. The advantage in it not coming through local dealers is that there is no dealer mark-up. The disadvantage is that it is much more difficult (if not impossible) to audition it before you buy. I guess that's where we reviewers come in, and in this case I hope that I have not just made you aware of the Havana, but reassured you that it is truly worth a place in any high-end system.